Today, I am reviewing another popular tool from the guys at Elegant Themes. Ever thought about an excellent plugin that allows you to create Email opt-ins that actually converts? Well, your prayers have been answered as elegant themes bring to you the Bloom Plugin. Elegant Themes has come up with numerous quality products in the past like the Divi theme and the Monarch Social Sharing plugin. Let’s find out whether the Bloom Plugin lands the expectations or not! Email outreach programs will always be the evergreen tool that brings more traffic and new customers to your blog. It a sure shot way to increase targeted traffic to blogs and online businesses. So, collecting emails in a genuine fashion should be one of the prime focus of your online business program. You can do this by using email optin plugins for you blog or website that entice users and readers to feed their emails to receive regular updates from your end. The plugin, which I am going to review today, will help you in that endeavor. There are a number of free opt-in plugins that you can find for WordPress but a premium tool is always recommend to deliver high quality and enhanced performance. First of all, it is really easy to start using the plug-in and set up an opt-in form for your blog/website but you should take all major steps to do it correctly. Unprofessionalism and poor quality of opt-ins can do more harm than good to your entire online reputation. The pitch that you make in your proposal should be appealing and attractive. 11 Indulge in A/B Testing to know what works best! The user interface is very friendly. It is very powerful and very easy to use even for a complete newbie to the field of WordPress. Once it is activated, you can start setting up your forms right away by using the interface. It comes with a simple an user-friendly dashboard where you can define each and every aspect of your opt-in. 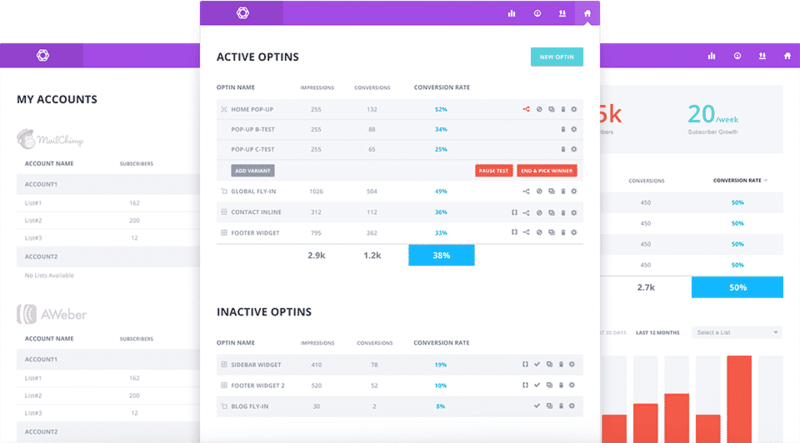 the dashboard can also be used to analyze the conversion rate of the opt-in forms and check whether your campaigns are on the right track or not. With the plugin you can choose from three different orientations. You can either opt for the bottom, left or right. Your choice depends on the location of your subscription form. The plugin allows you full control over the number of forms that you wish to show on each page. This is another small but good feature from the Bloom plugin. However, this is something expected from all good optin tools out there. You should choose the color of your optin form that stays in sync with your theme and layout or else it can become irritating for the user. These messages pop-up with email subscription files. They are the most popular optin format and bring many conversions if setup properly. Bloom allows you to add effective settings to trigger the popup without any irritating distractions. The timing can also be setup as per your understanding and you can also set triggers for when a user reaches the bottom of a post or page or even after they comment or make a purchase! Isn’t that great. These are pretty similar to pop-ups but are triggered by user interactions such as timed delays or when the user reaches the end of a page. These kind of forms look very professional and attract users. These forms come into action when you want them to. You have to place the form in custom places as per your needs. You can configure the forms, generate the short codes and place them through the WordPress post editor. Another highly popular form of optin form, this optin has a reputation of converting readers at an excellent rate. You place the form at the end of the article. It is great way to convert readers based on high quality content. If your posts and articles are top notch then your readers will feel the urge to subscribe to your feeds via email. 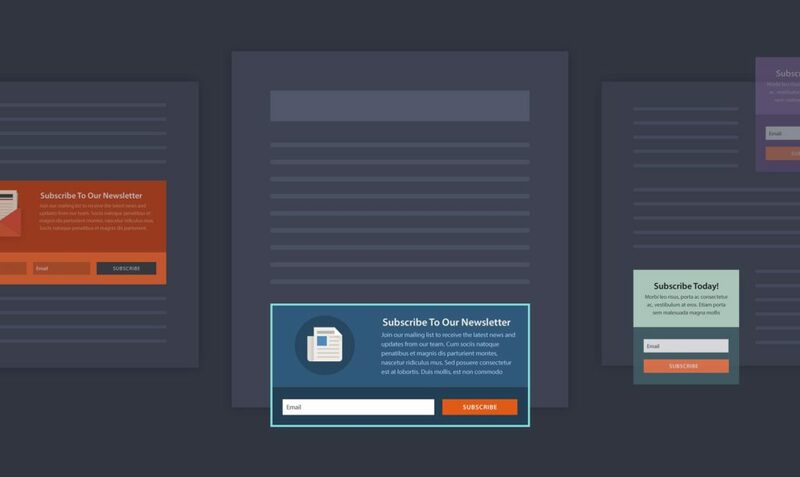 If you wish to place email subscription opt-ins in the sidebar you can do that easily with the bloom plugin. You should keep in mind that this kind of optin will only be effective if it’s prominently in the sidebar region. This is generally a good option for bloggers and online influencers who already have a strong presence and following on the Internet. Readers usually find their content specifically and thus are poised to subscribe to the news feed. Users will have to submit their email id in order to gain access to the content. If you are a newbie then you should strongly refrain from this method. On of the trademark features of the plugin, you get over 110 customizable templates to choose from. You can get started and make optin forms on the go. This is boon for bloggers with no technical background. You can create flawless optin forms without having to write a single line of code. You can easily change and modify all these elements like title, message, image, animation effects, fonts and border. You can fix them to suite your needs and imaginations. The diversified array of pre-made templates allows you to create patterns and designs exactly according to your personal specifications. That is one thing I love about the bloom plugin. It offers great flexibility when it comes to the backend user. You can also change the CSS and customize it to modify a template according to your needs. If you choose this option then the users will see the optin after a predefined time. Only after the users have spent that amount of time on the website will they see the optin appear. It is a really effective plugin as it projects a sense of credibility for your website. The user spending more time on your website means he/she is taking interest in the content you have to offer and there is a greater chance that he/she will convert. This is another very effective plugin. The user goes through your entire post and only when he reaches the end the optin will appear. This is also one of the most used strategies by bloggers across the world. This is a relatively new form of optin. You can define the percentage of the page the user will scroll after which the optin will appear. The option will seem interesting as the person gets it after reading your content, which might mean that he is interested. As the name suggests, if a user comments on your post, only then will the optin appear in front of him/her. This is usually very effective as comments generally mean a high level of interest from the reader, which in turn means a fairly high chance of conversion. The Bloom plugin also offers optins for ecommerce website owners. The option can be extremely effective. A purchase means a show of trust and therefore the chance of conversion is very good. Sometimes it so happens that a user opens a page on your website and leaves it hanging around. This is what inactivity means. In this case the inactivity trigger can be very effective in catching the attention of the user. Therefore, the bloom plugin offers a number of ways you can trigger your optin forms. Be sure that you use them professionally and accurately to get maximum conversions. The look and feel of your forms is of vital importance. They can attract readers or repel them. They can convert your visitors in an instant or leave them astray and increase the bounce rate. Therefore, everything has to be taken care off, even the borders and edges. With the Bloom Plugin, you can easily manage the borders and edges of the forms. You get a number of options to design and decide the borders and edges of the optin forms. You have complete freedom to choose the color that you want and there are different styles to choose from too! With the plugin, it is you who solely decides how the forms are displayed. You have comprehensive display setting through which you can setup the spot where you want your optin to appear. You can set up forms for the entire site or go from post to post. This option is also flexible as you can override the selected option while editing each post. According to latest Internet statistics, mobile search traffic is already toppling desktop search traffic. That’s why bloggers and internet careerists should take care that there websites are optimized for mobile use. This also means that your optin forms should be optimized for the mobile user. With the Bloom Plugin you have got mobile optimization covered. 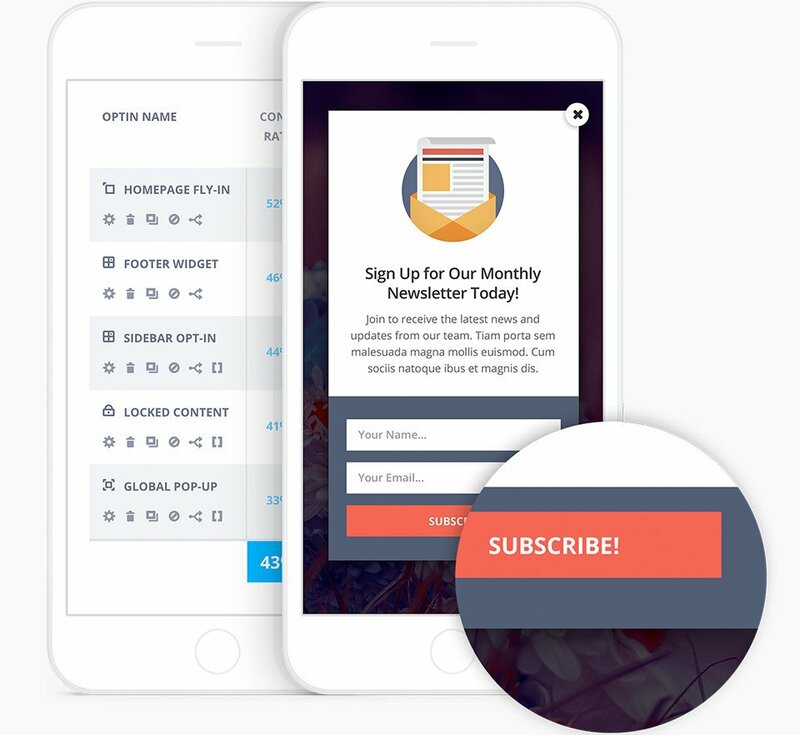 Your email optins are completely optimized to appear efficiently on mobile browsers and smartphones and ensure that no potential subscriber is lost. Even the plugin dashboard is completely mobile optimized so that you can work in High-resolution even on the smallest of devices. The sole purpose of email optin forms is to collect emails for the purpose of email marketing. The automated integration with the Bloom Plugin allows your email provider to access the database and populate its lists automatically. 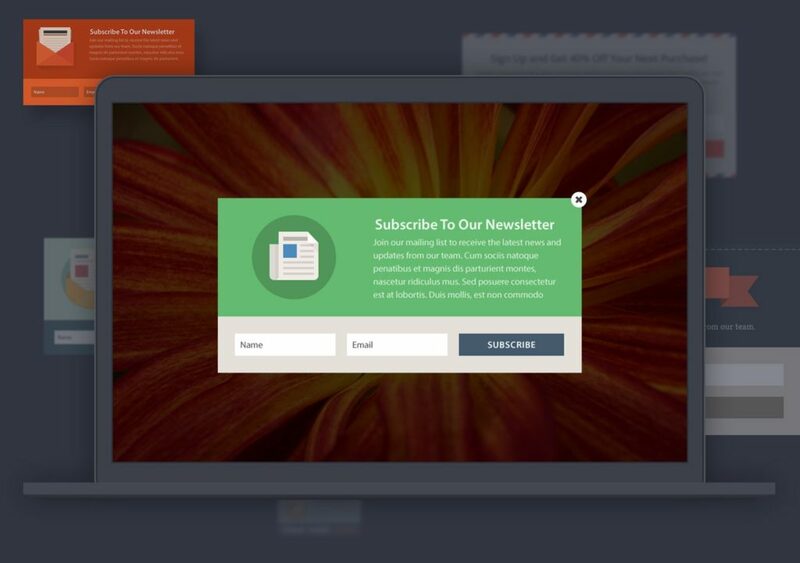 The Bloom Plugin integrated perfectly with 12 most poplar email-marketing providers like MailChimp and Aweber. I like this feature a lot. With the Bloom Plugin you can choose the posts and categories where you want specific forms to appear. This allows you to strategize for higher conversion rates as some your categories may be inviting more traffic than the others. Indulge in A/B Testing to know what works best! A/B testing is an increasingly popular process which lets website owners know what kind of form placing strategies work for them and result in maximum conversions and subscriptions. The Bloom plugin will effectively help you to test out your forms at various locations and will showcase you the detailed results so that you can make informed decisions in the future. You can then easily compare the form placements and triggers that work best for you and thus ensure maximum results for your content campaigns. Metrics and numbers are a great way to measure performance of your blog. Getting to know the performance of your optin forms allows you to fine-tune them to perform better and result in maximum conversions. You can go directly to the statistics page and get to know the number of impressions, the conversions and the conversion rates. This helps you to understand how effective your placements and triggers are and thus, you can make more informed decisions in the future. This will help you to consistently increase your conversions over time with better strategies and improved content. If you are a member of the Elegant Themes Club then you get this plugin in the package. If you are not, then I suggest you give it a try. The whole package costs you $89 and you get access to over 86 premium themes, plugins and tools including the Divi Builder, which is highly acclaimed. I believe that the Bloom Plugin is an excellent offering. Not only it allows you to create flawless optin forms to increase traffic conversions but allows you full control over design and layouts. You can decide each aspect of your forms and make sure that your readers are not exposed to annoying marketing hacks. Investing in Elegant themes is a great idea as it will take care of every backend blogging need there is when it comes to WordPress websites. With over 100 templates, unlimited color options, 100% customization and flexibility and a bucket load of more features the bloom plugin is a dream come true for any blogger. They also have a 30-day money back guarantee. I guess that is just great. This means that there is virtually no risk in trying the plugin out. I think 30 days is a good enough time period to make a decision. You can always have the money back. Coming from Elegant themes, the tool has strong reputation and an awarded team behind it. You can always reach them in out in case you need help. Do share your experience with Elegant themes and the Bloom Plugin here in the comments section!